Have you read or seen The Fault in Our Stars? There are so many great quotes and moments in this book and movie. I loved the book for several reasons, but mostly because Juliana loved it so much and read it 8 times. It was hard for me to read it just once. I finished the book a short while ago and promised her I would read it before watching the movie with her. She had to wait a very long time. Tonight was the night to finally snuggle on the couch and watch it together. The movie made me cry, but not in the sappy parts. I cried when they got to Amsterdam because I’m a sap (according to Juliana) and wanted to be back there again walking on the canals. I’m also weird in that when I read a book, I take forever and take notes. I don’t know why I take notes, but I guess I hope I’ll remember the main parts that way. But I don’t. At least I have my notes and the good news is, I found them again before writing this post. “Two emotions – love and fear.” I choose love. “Amsterdam was a city designed for movement and activity.” Love, love, love Amsterdam! “I believe the universe wants to be noticed.” I see you. “I’m on a roller coaster that only goes up.” I wish. “Grief does not change you, Hazel. It reveals you.” Grief is a tragic, beautiful side of life. We are so vulnerable when we are grieving and we discover our true nature that sometimes is masked by our daily routines and reality. What is your favorite quote? Namaste, BeLovers. You know how you share a story and usually someone knows someone who also has a similar experience? Well I’ve been sharing, somewhat quietly, that I have had severe neck and shoulder and back pain over the past month. I don’t like to talk about it too much, because I don’t want to be defined by my pain and I don’t want pity. It’s just something I have and it’s limiting my abilities and I don’t like it. I want a solution and I want to know what’s causing it and how to fix it. What I hear from doctors is that it will take awhile and to be patient. But I want to know what is causing it and why and how long, specifically, will it take to repair. There doesn’t seem to be an easy solution. But the reason I am sharing this story, is because I am not alone. As I share my story and also see the number of hits to my old post about dry needling and headaches, I know there are many more of you in chronic pain. Why? Is it our computers and smart phones that have us hunched over and compacted, typing furiously? Is it from over use and perhaps repetitive stress? I don’t know exactly. What I do know is that as I bring it up, I’m hearing from more of you that you’re also trying to figure out what feels good and what doesn’t and trying to heal yourself. Here are some partial solutions and I’m still waiting for the holy grail. 1. Dry needling – this really helped in Amsterdam and it provided relief for about a week or more. 2. Therapeutic Massage – probably my favorite treatment, loosening the muscles. 5. Chiropractic Adjustments. My least favorite and most scary treatment. Does provide some relied. 6. Yoga. My second favorite treatment. 7. Physical Therapy. Focused on core strengthening exercises and using the foam roller to loosen up tight spots. 8. Ibuprofen – to reduce swelling. 9. Ice packs and heat – whichever one feels good at the time. 10. Internet exercises – found some neck relief strategies and core strengthening basic exercises that I loved. 11.Drugs- flexoral – I think that’s how you spell it. It’s a prescription muscle relaxer. 12. Posture alignment – I haven’t tried this one yet, but supposedly there is this 70 Year old woman in Palo Alto who will teach you proper posture that should help us to use our bones properly to support our bodies. So very interesting and I bet she’s spot on. She teaches how to stand in alignment, how to sit on a chair, and will also teach you how to lay in alignment. 13. Hot baths and hot showers. 15. MRI – haven’t done this yet either. These are a few of my favorite things that I’ve tried or learned about from all the 40+ men and women who have been sharing their stories and experiences with me. I wish we didn’t have to share this connection. 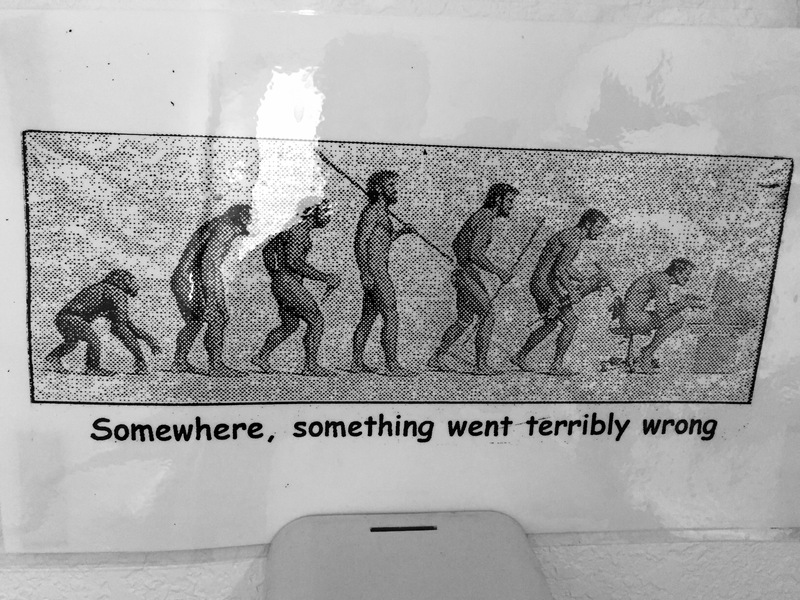 The problem with back and neck pain is that it is all connected and we don’t always know where or how to treat it and it moves! It calms and it flares. It is debilitating and I wish there was a a cure! I wish you well and hope your pain goes away. Tell me what works or has worked for you. Not that it’s weird to walk home. I’ve just never walked home from the car dealer that seems so far away on the other side of town. I plugged in our address and it was a 2.6 mile walk. I had my fitbit and thought it would be great to actually walk instead of sitting and waiting for a ride or inconveniencing a friend to come and pick me up. And it was so sunny and beautiful out; a perfect day for a stroll. So I walked up the El Camino. If I was in Amsterdam, I wouldn’t think twice about walking this distance. But for some reason, it felt so far away and people just don’t walk up this street. Isn’t that weird? I walk through my neighborhood and walk with friends and hike more than double that distance, but this just felt different. At first I felt weird, walking by myself. But then I started to have fun. I noticed the lady sitting in the grass, reading the paper waiting for her car to be repaired. There was a young mama pushing her toddler on a push bike through the intersection and another young boy casually taking his time, walking slowly as the light turned red and stopping traffic. A bus had to slow to pass a bicyclist who had no idea there was a bus right behind him. 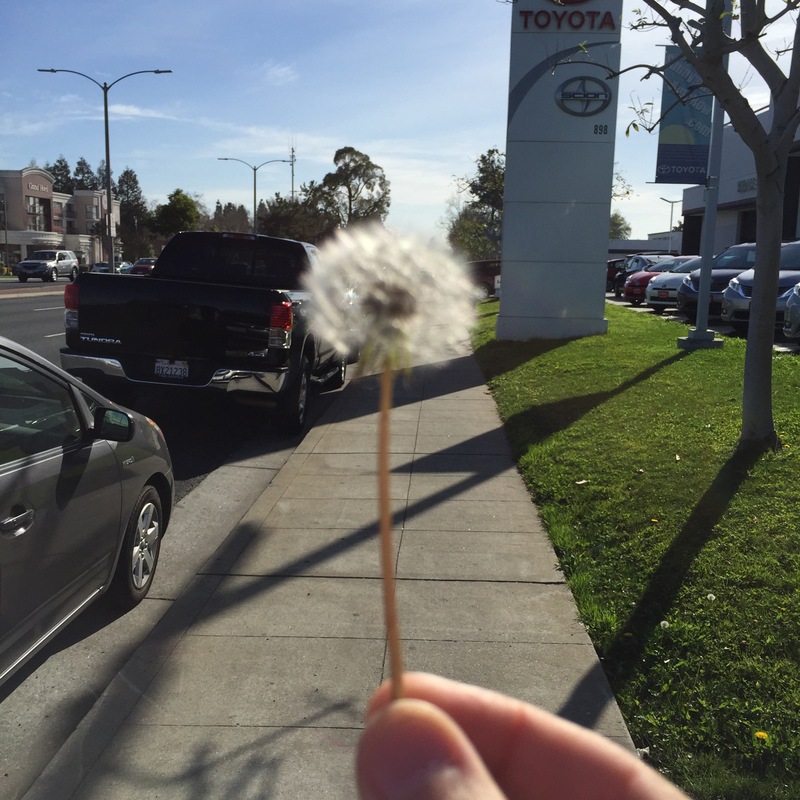 And then I noticed the wishing flowers and made wishes. This made me giggle. 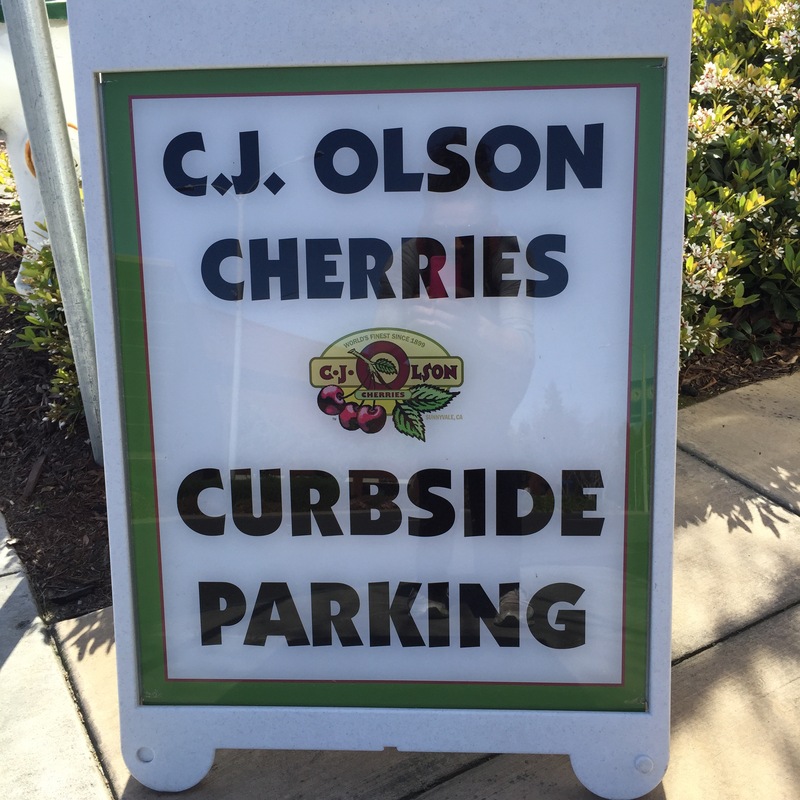 There is an old cherry stand that I’ve always wanted to visit, but never have in the 15 years I’ve lived in Silicon Valley. As I walked past, I turned around and went in. It was so cute and filled with great items to fill gift baskets and wonderful fresh fruits and vegetables.i bought fresh produce to make a salad for lunch and put it in my backpack. I talked on the phone with my sister, and enjoyed the journey from a different perspective. On the last part of my walk, I even heard chickens clucking in someone’s yard, that I would have never noticed from the car. 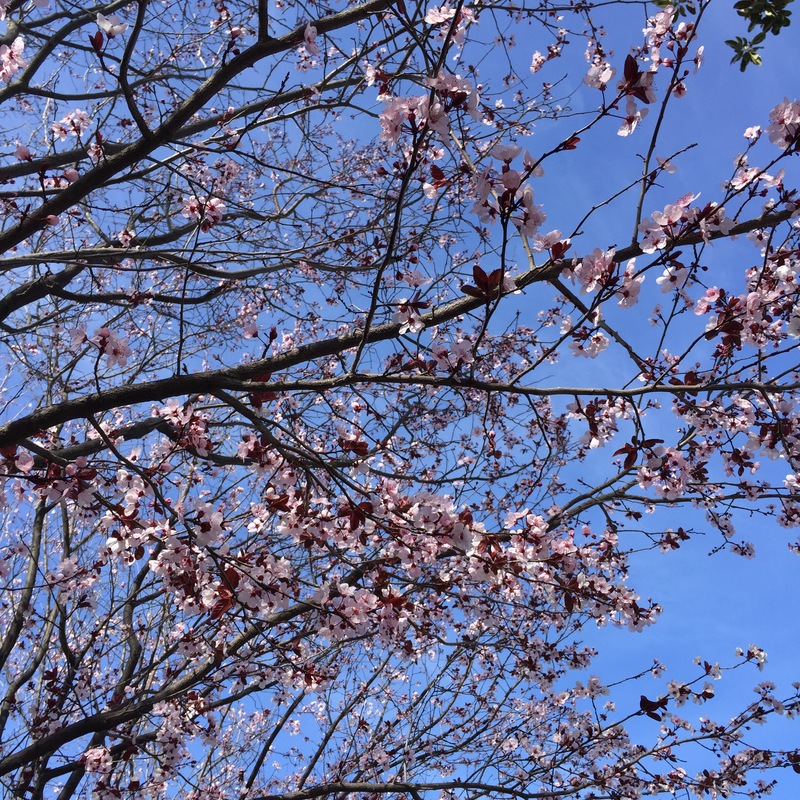 I also noticed the cherry blossoms blooming and little petals falling. 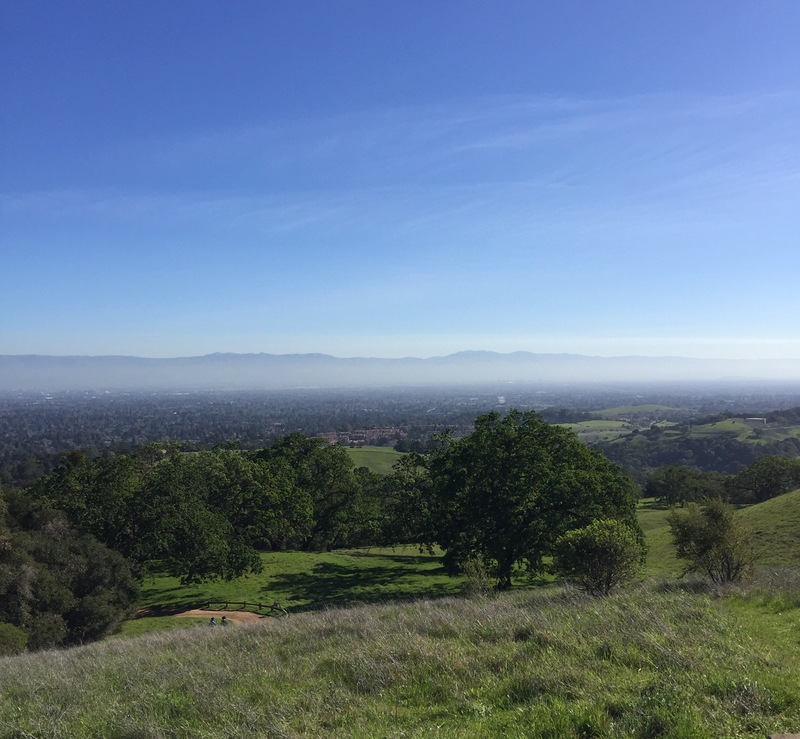 Walking along the El Camino was definitely outside my comfort zone, yet provided several levels of comfort, and even some exercise. Hope you had an interesting day! 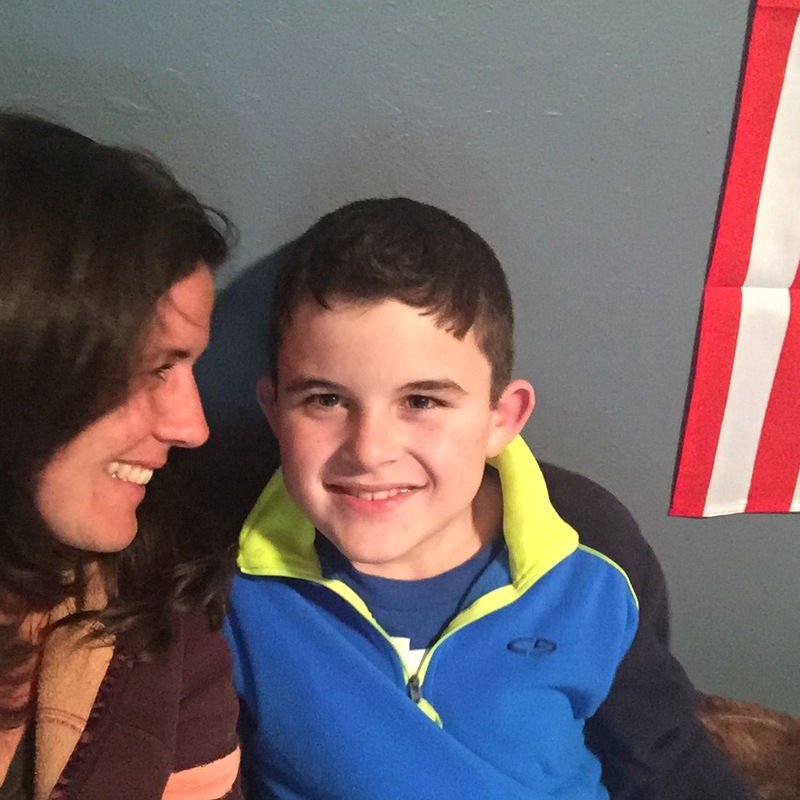 When kids are little, we love (over)sharing stories and pictures of our pride and joy. It’s easy to share the cute and good stuff. Have you noticed when kids start to grow up, we share less and less? Part of that is because of their privacy and they have a say about what they want others to know about them and we respect their wishes. Part of it is because it’s not as easy any more. Some stuff is embarrassing and challenging for us and for them. We don’t want people to know we are struggling and are vulnerable. And our kids don’t want others to know either. But we do struggle and we are vulnerable and that’s ok and totally normal too. Our kids are still cute and our pride and joy, we just have to be a little quieter for awhile. Know what I mean? 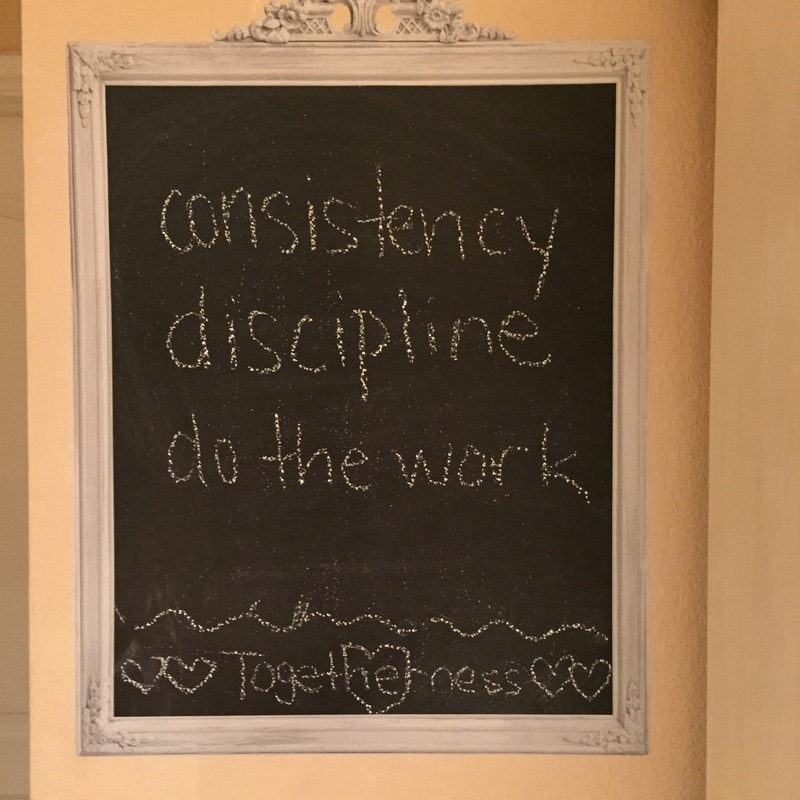 The top three words – consistency, discipline and do-the-work are important reminders for all of us, and especially for me and my parenting and weight management skills. Thank you to my tribe of sisters for their reminders and encouragement. You are loved! The bottom word, togetherness, is my word of the year. So far, so good. Love this life. Trials and all. I slowed down today and went outside to eat my favorite homemade salad that contained arugula, beets, goat cheese, toasted pine nuts and balsamic vinegar. I love these flavors mixed together so much. It tastes like heaven! 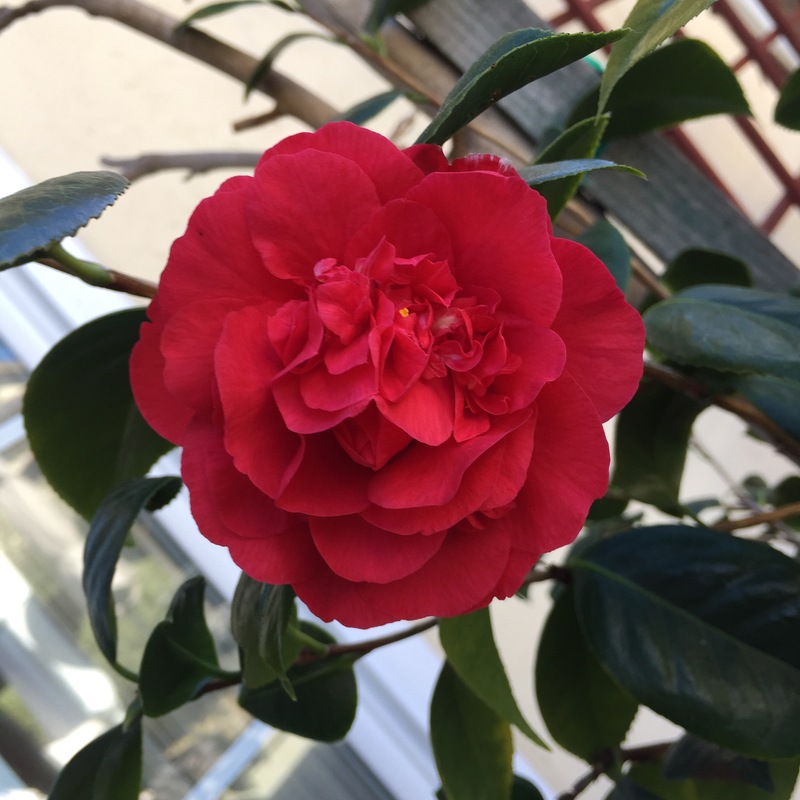 I noticed that the flowers in my yard are all starting to bloom and little buds are forming. What initially called me out there were the little birds singing. ML asked me if I noticed the birds singing recently, which I hadn’t but today, the sliding glass door was open letting in fresh air and I heard their songs. Instead of eating quickly inside, I slowed down and went outside and took it all in. It was good. Afterwards, I continued on with my work and soon picked up kids from school. Later in the day, my sister called and the sunlight was calling my name again. Instead of sitting on the porch, I decided to chat and walk around the block for some exercise and uninterrupted time while I watched the sun begin to fall. I love this type of lighting and the feeling of it’s warmth on my body. 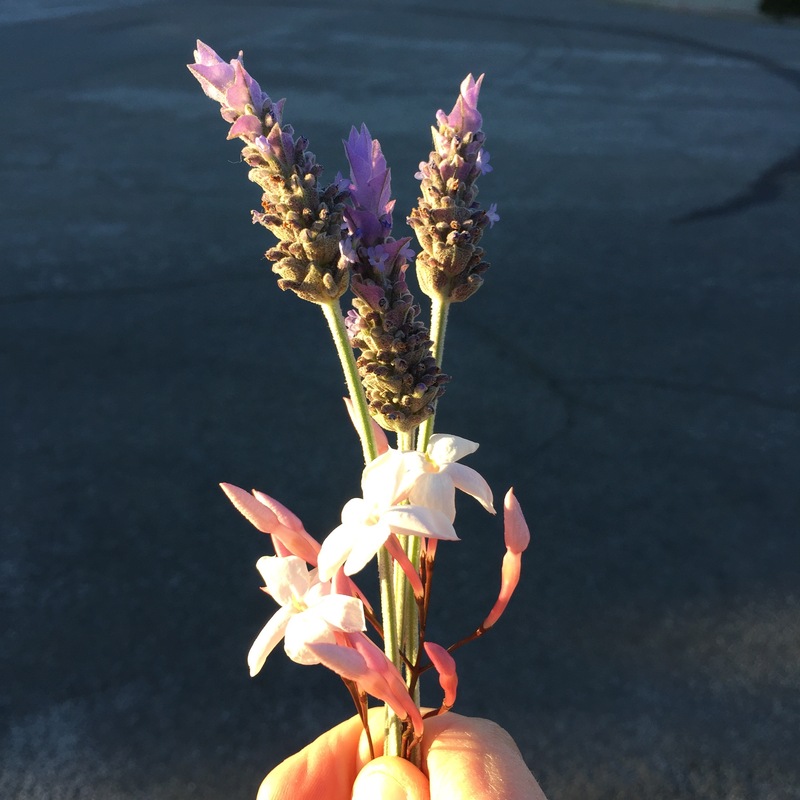 I picked some snippets of my favorite fragrances along the way and made myself a little bouquet. The jasmine and lavender smell so good and are very calming. Lavender is my favorite scent, followed by vanilla. What are your favorites? What did you take in today? Did anything slow you down today to help you enjoy the little things? I know we all have our big things and worries, but don’t forget… we just need to open our eyes to enjoy the little moments like birds chirping or a hug from a child despite it all. It’s all good. This kids cracks me up. I was looking for him today and found him perched on his dresser in his closet. 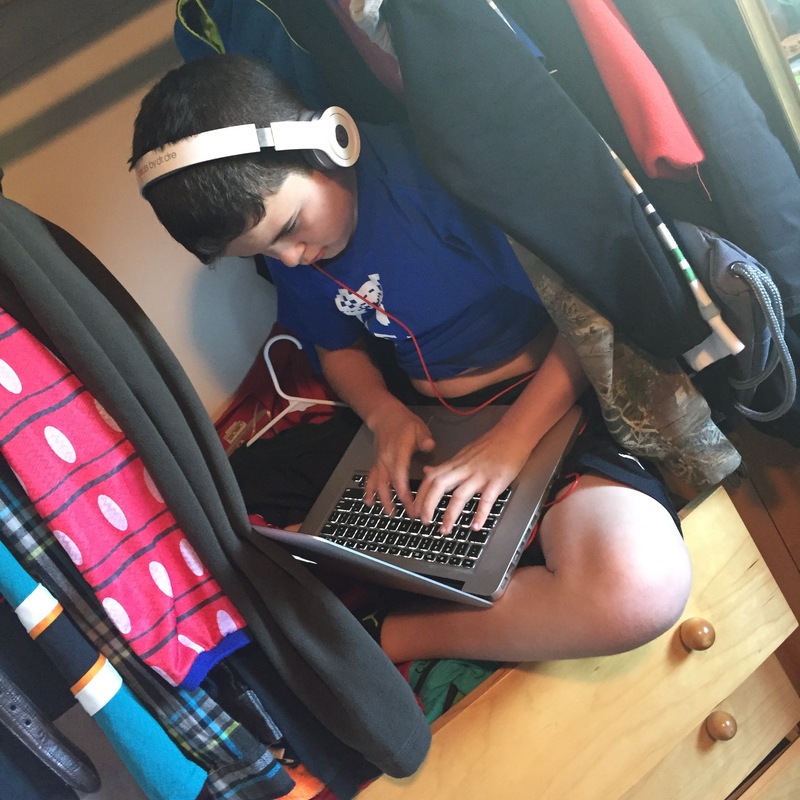 He borrowed his brother’s headphones and was creating his March article for the school newspaper, using Google Docs. I think it’s really cool that he chose to be on the school newspaper editorial team and I think it’s funny that he likes to hide and work in his closet. He makes me laugh. I like to think that maybe my blogging every night influenced his interest in writing too. I love that he shares my passion. Tonight I was tired and told him it was time to go to bed. He wanted to read with me while I was working and I told him to go to his room. When I came to check on him, he invited me to join him instead. With his big, beautiful doe eyes he looked at me and said how much he loved me. I told him these were the best words ever and was the greatest gift he could ever give me. He asked me if I wanted to come sit with him on his couch and write my blog while he read. How could I refuse? I know my priorities and I know these little moments are what make life matter. I was in a bad mood today. I was frustrated and irrational. Yes, it’s true. Just ask my family. I have my neurotic moments. I hate these feelings as much as they do. I thought about my post from yesterday about happiness, asking myself if I was happy and I was definitely not, at that moment. I like to practice what I share. I asked myself, “do you want to be happy?” And at that moment I wanted to be mad and did not want to release and let go. I stayed mad and quiet and wanted to feel what I was feeling, but not for long. I received a text from my friend saying just the right words at the right time. We were supposed to meet up and I was running late. Wanna know what her text said? It was so simple and perfect timing. It said, “Happiness Awaits.” How did she even know? She didn’t and that was a beautiful thing. That’s all I needed to read to change my angry mind. I was ready to be happy again and gave myself the rest of the car ride to get over myself. I decided to make a change. I chose to be happy and believe it or not, was. I let go. I surrendered and enjoyed myself despite what I was feeling 10 minutes before. It was that simple and that sincere. No joke. Our minds are so flippin’ powerful. We just have to decide what we really want and surrender. We have to be focused and determined and have to fight for what we really want, and not allow our irrational feelings win. Be happy, BeLoveRs. It’s so much better than the alternative.